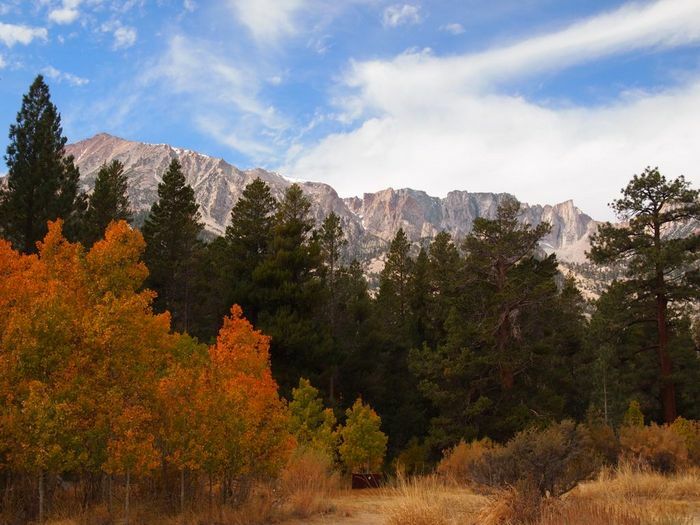 Now that we’ve made it to California the plan is to slowly make our way down California’s famed Hwy 395, on the eastern side of the Sierra Nevada Mountains. We’ve been hearing from numerous other travelers how wonderful this route is and are excited to experience it for ourselves. 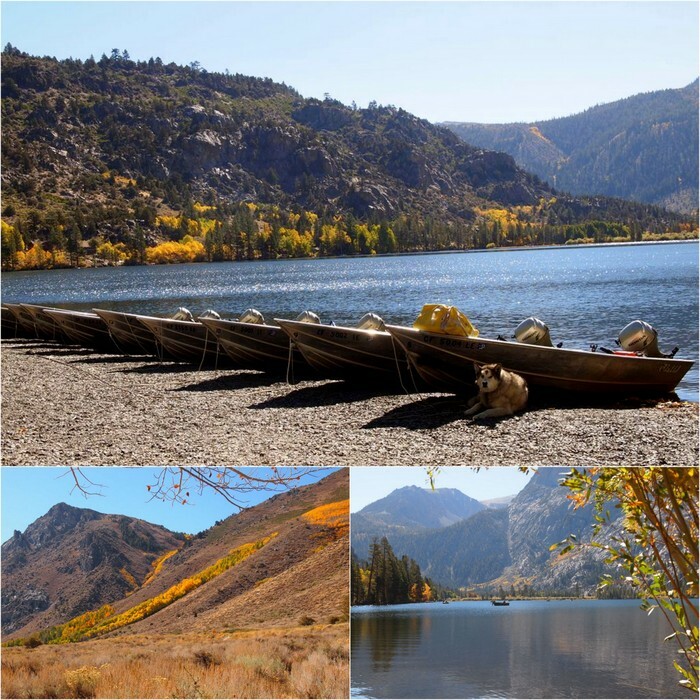 We thought our first stop would be at the Oh Ridge NF campground on the shore of June Lake- but our government had other ideas. Too bad because we drove over to check it out, and it was awesome. Guess we now have the prefect excuse to come back some other time when it’s open. It all worked out in the end though, thanks to the wonderful generosity of our fellow RVrs and blog readers who shared numerous free camping options in the area. The spot where we ended up is not far from June Lake. What it lacks in lake views, it more than makes up for it with this fabulous view of the mountains. It’s been very peaceful here and the location is convenient to everything we wanted to see in the area. 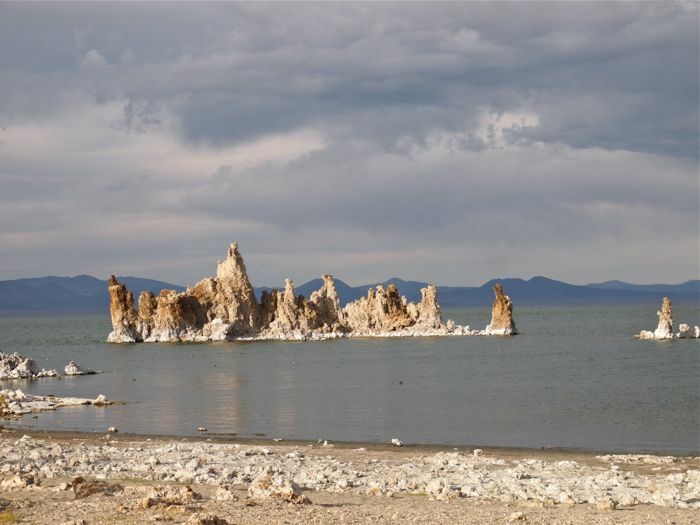 Number one on that list was Mono Lake. I am not going to bore you with the details of this very, very old, very, very salty lake and how the city of Los Angeles nearly sucked it dry and ruined it forever along with some prime bird nesting grounds. What I will tell you is that since 1994 efforts have been in place to restore the water level of the lake, yet due to drought and other factors that goal has not been met nearly 20 years later. 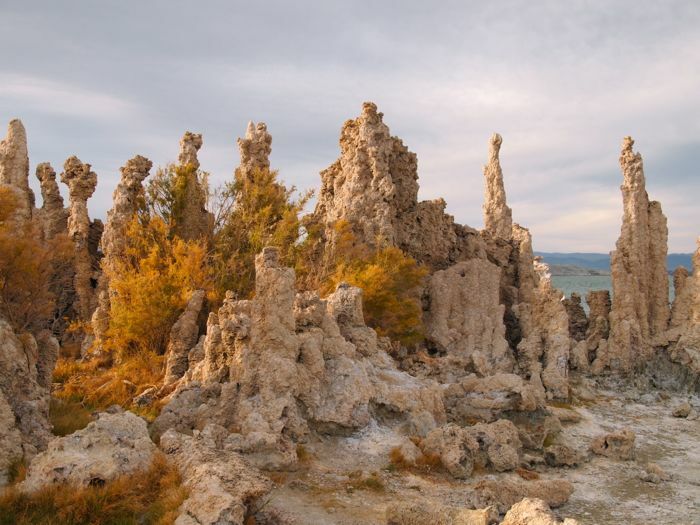 I will also tell you that the low water level of the lake has exposed an incredible landscape of tufa towers lining the shoreline. These limestone formations grow underwater and can reach as much as 30 feet tall! 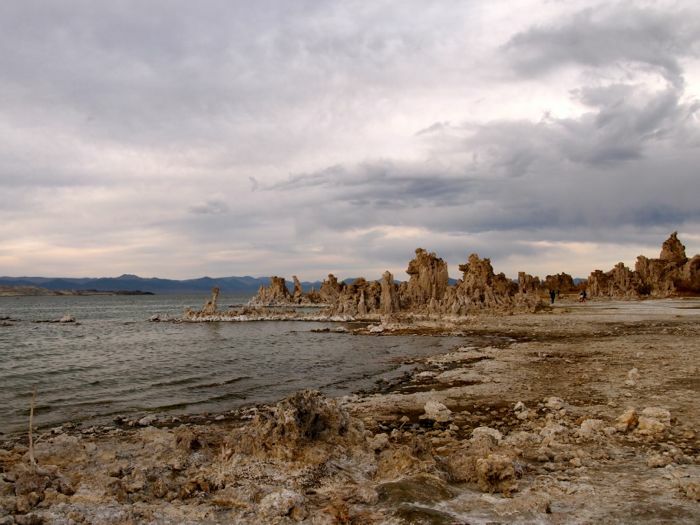 One afternoon we drove over to the Mono Lake South Tufa trail to check out these bizzare formations in person. 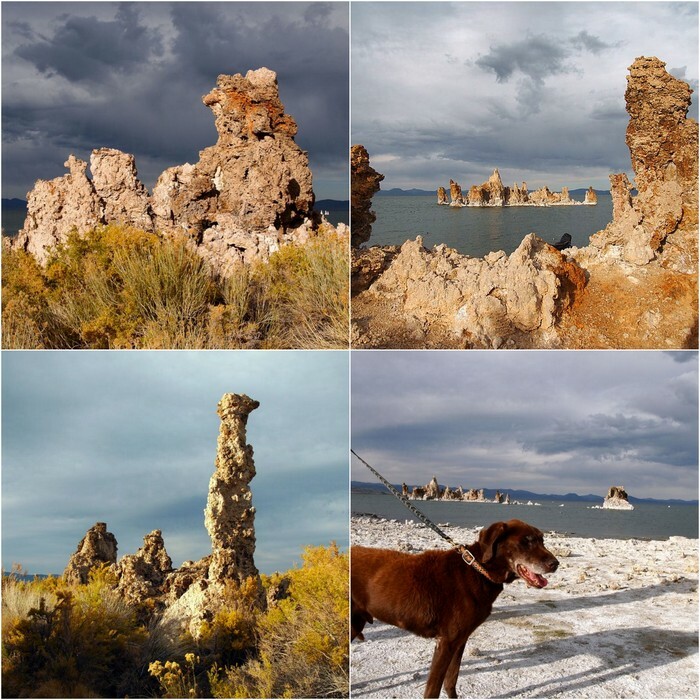 We followed the winding trail through a maze of tufa and marveled at these wonders of nature. 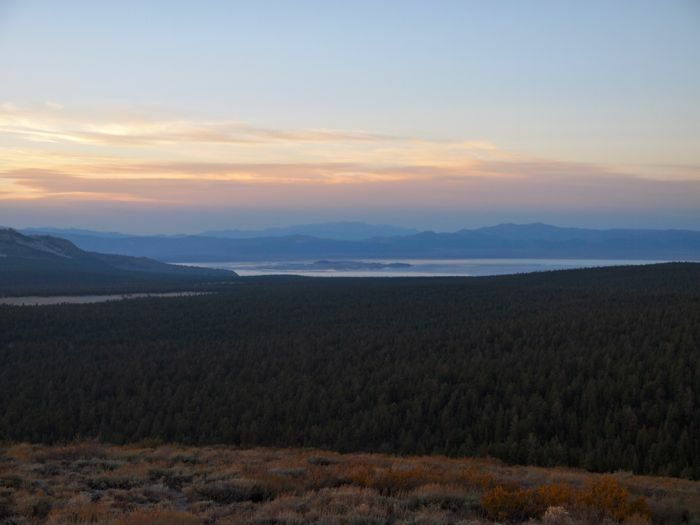 For a different persective of Mono Lake we took a drive one evening to the top of Bald Mt. From there we had a lovely view of Mono Lake in the distance. The forest service has a fire tower at the top of the mountain as well as a warming hut for hikers. There was no one up there when we visited, but we peaked inside to find a cozy looking woodstove and lots of evidence of previous visitors. 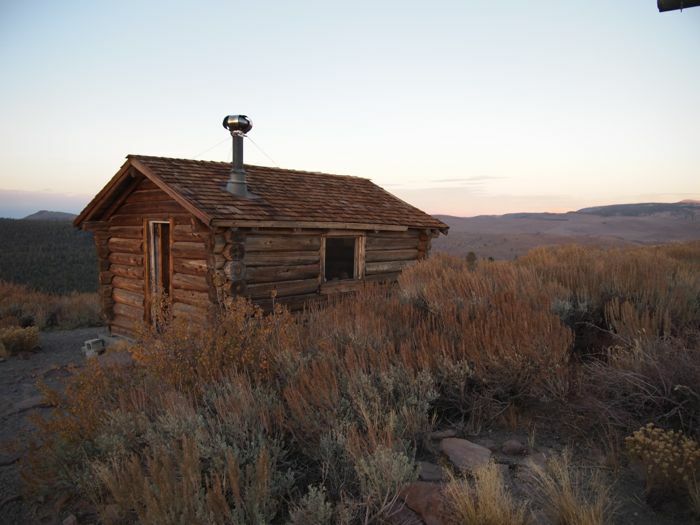 Too bad the wood stove wasn’t going, because it was cold and windy on top of that mountain! We stuck around long enough to watch the sunset over the mountains and then hopped back in the truck and drove home with the heat blasting. Since we’ve never been to this part of California before it’s hard to say for certain, but I suspect this might be one of the most beautiful times of year to visit. The fall colors have been incredible. I always miss my old home in Vermont the most in the fall when the northeast explodes with firey reds, oranges and yellows. Unlike last year when we spent the fall on the Oregon coast, which had its own charm for sure but not much in the way of fall color, this year I feel like I am truly exepeincing all that fall has to offer. Check out these golden Aspens! Of course, if living in the northeast has taught us anything about fall, it’s how quickly the weather can change. Apparently the same holds true over here in the high California mountains. After many days in a row of bright sun and warm temperatures yesterday morning we awoke to this. It wasn’t a complete surprise since snow was in the forecast, but it wasn’t supposed to start until mid-day, so waking up to find it already on the ground was unexpected. It snowed for most of the day, but since the temperature was hovering around the freezing mark it didn’t add up to much. That is until around 4:00 when when the temps dropped a few degrees, the flakes fell faster, and the snow started to pile up. This morning the sun is out, and athough it’s still below 30 right now, the temps are supposed to climb into the 50s this afternoon, so I am sure it will all melt away before the day is over. Guess this means we need to head south! 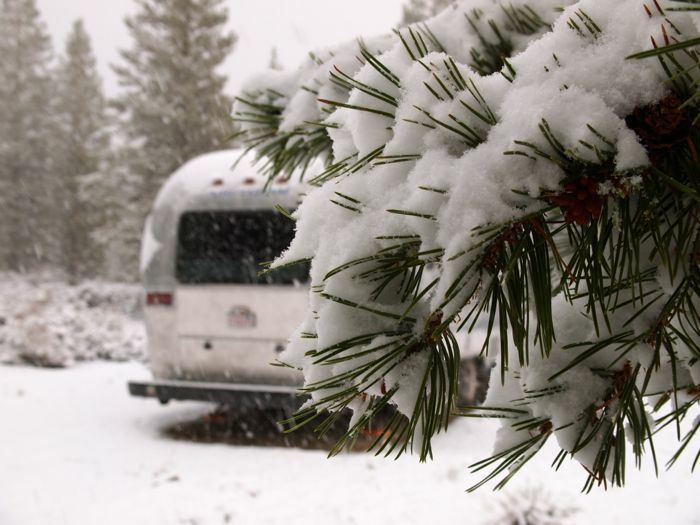 I would LOVE to wake up to snow some day in the RV! I do love that part of California, Hans and I will have to travel through there some time in the next couple of years. Thanks for sharing the lovely sights! You absolutely should travel through here. We’re already in love with the area. The snow was pretty, but we were glad that it didn’t stick around. 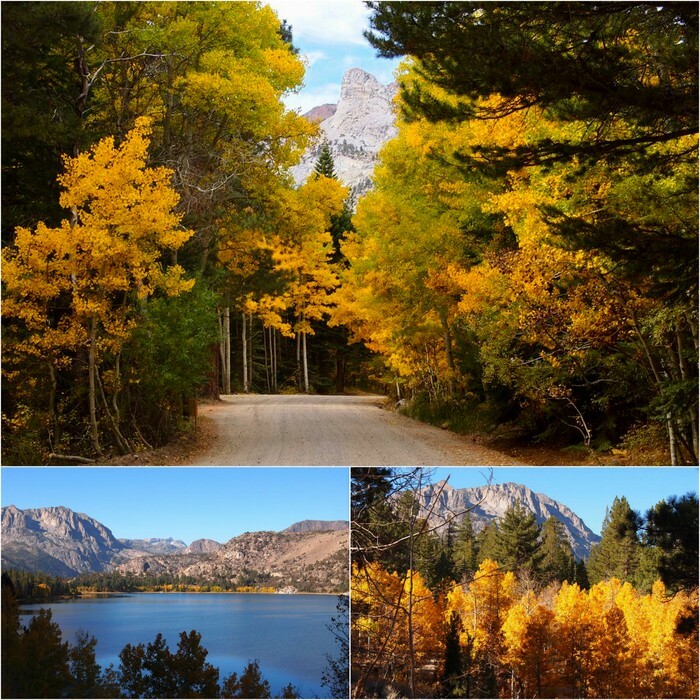 Great fall colors and although the snow looks beautiful, I agree….its time to head south. 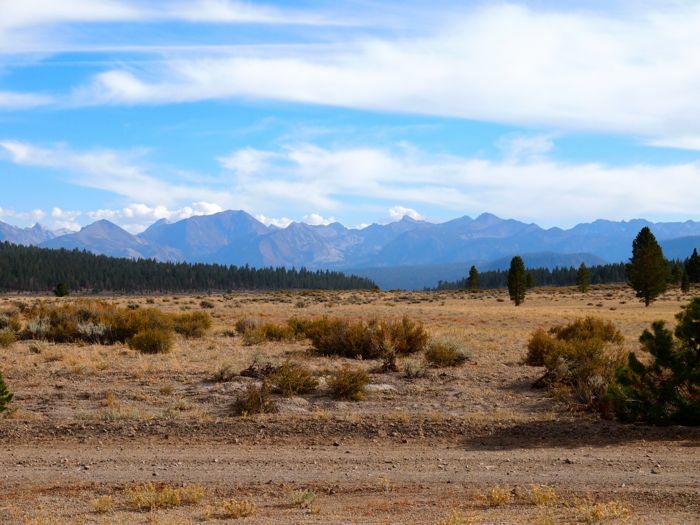 Hwy 395 is definitely on our list of ‘must see’ as several bloggers have posted about this unique and interesting area. That Mono Lake really looks like another planet! I can see why you love it here so much. It has quickly become one of our favorite places. Hope you make it back here soon! Oooh, great fall colors and a pretty snowfall! You are living the dream. 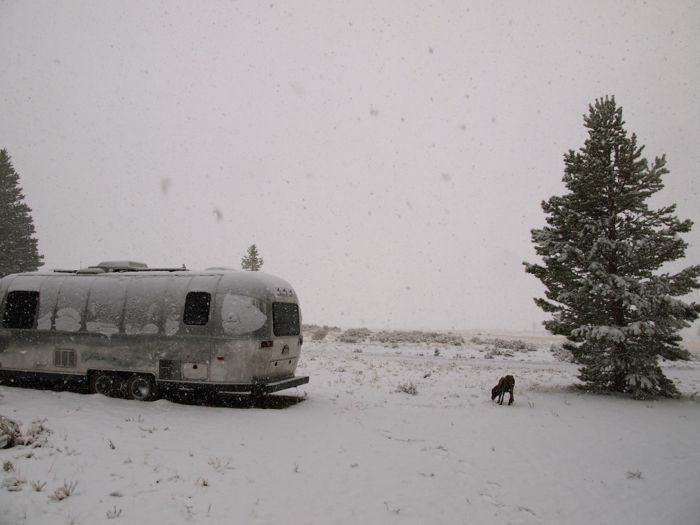 How do you stay warm in the Airstream? Do you have issues with freezing water in your tanks or supply lines? We may switch over to one next year (our bus is too big for some of the places we want to go!) and I’m curious about the mechanical systems for colder temperatures. The Airstream does surprisingly well in the cold temps. Of course, we have never experienced below freezing temps for days in a row. All the times we have had below freezing temps at night it then warms up into the 50s or 60s during the day. This was the first time we ever spent a day with temperatures around the freezing mark, and while we burned through a lot of propane (both the furnace and our wall-mounted catalytic heater run on propane), there were no issues with freezing tanks or lines. Our furnace blows hot air through the area where the tanks live so I am sure that helps. Also we’re dry camping so we don’t have any exterior hoses that could freeze. 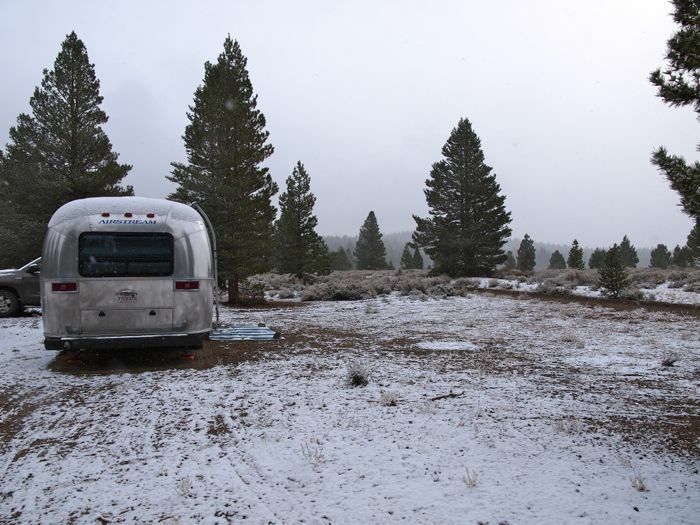 I am not sure how Airstreams compare to other RVs for cold weather camping, but so far the small amount of nights we have spent in cold temps have proved to be no problem at all. 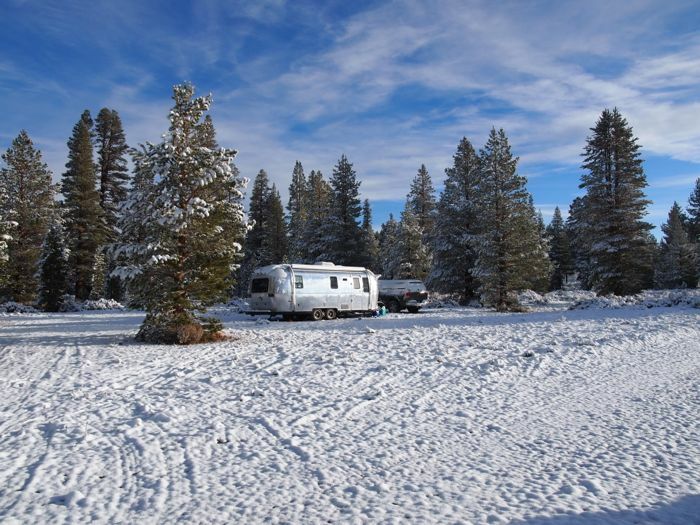 As for our comfort level, the small space heats up very quick and we often joke about how much easier it is to heat an RV compared to our house. Saw your blog yesterday for first time. Loved it. Great photos too. I imagine you are well south on Hwy 395 by now. Yes, it is one of the most spectacular drives in California. There are so many places to see and things to do between Mono Lake and Owens Lake: Alabama Hills, Manzanar (may be closed b/c of fed. shutdown), petroglyphs, etc. if you need a cold one when you get to the south end, check out the Indian Well Brewing Co. in Indian Wells (on Hwy 14, 2-3 mi. 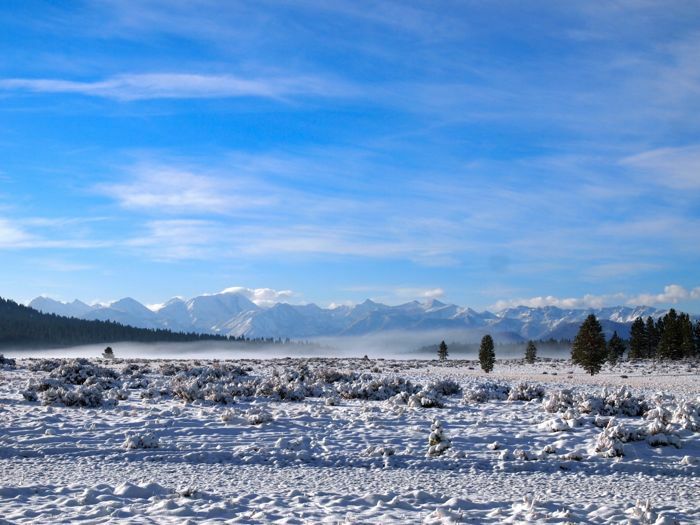 west of Hwy 395). Thanks for the tips. Will definitely check out the Brewing Co! 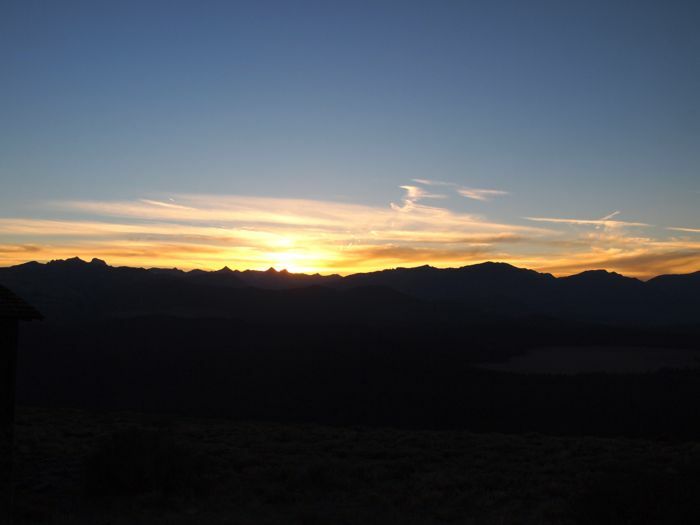 You will be passing right near Keough Hot Springs. It’s worth a stop for a warm dip. Oooh, thanks! We’re in Bishop now and will probably stay two weeks so we’ll definitely have time to go check out the hot springs.